Previously, on MinerBumping... Highsec miner Th3 s7rYn6 lost his Retriever when ganked by Agent Mildron Klinker. Out of nowhere, Th3 revealed himself to be a powerful hacker. 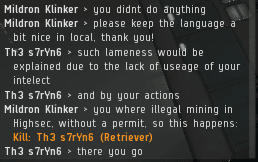 He waltzed into the "Mining" channel and demanded a ransom of 300 billion isk--or else he would take down the MinerBumping website. Gorila Vengaza > Th3 s7rYn6 what ya mean?? Th3 was unimpressed by the Code and/or coding of MinerBumping. The New Order's website was at his mercy. The deadline was set. The New Order had only 24 precious hours to come up with the money. Now the clock was ticking. Would the New Order survive this deadline, as it had the other hundred or so deadlines set by rebel forces? Jezzer Shras > Yeah...threatening to take down a website...not a good call to do publically. Just my two cents. The situation was more dire than anyone realized. Th3 wasn't making idle boasts: He'd already tested his ability to take down the website. He took it down five times in one day. Imagine the service interruptions that would result if he took it down ten times--or even a hundred or a thousand times--per day! Th3 repeatedly reminded everyone in the Mining channel that the New Order needed to pay, and fast. But after a few reminders, Th3 recalled that he was in a Mining channel, and that he didn't want to spend 24 hours randomly typing numbers into it. Th3 checked his wallet the next day. The deadline had passed, and no billions were to be found. Th3 found the Agent who had destroyed his Retriever and bragged about the death of MinerBumping. Mildron was confused. He was reading the dead website. Th3 was annoyed by Mildron's ignorance of computers. The only reason MinerBumping wasn't dead now is that Th3 had stopped killing it. Duh! Mildron gently reminded Th3 of his dead Retriever, the price of disobeying the Code. Now was not the time to pretend to bring down websites. Now was the time to buy a permit. Th3 was temporarily brought out of his hacking-induced daze. Mining permits? Th3 continued a recent trend of new players pretending to be old ones. He had no idea why it wasn't smart to fly a Retriever with completely empty midslots, lowslots, and no rigs. The carebear wasn't yet convinced that he needed to go with the permit option. 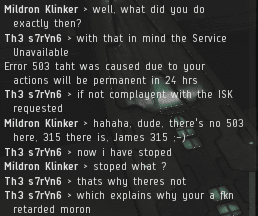 He still held out hopes of getting the 300 billion isk ransom. However, he needed to make the New Order understand how hacking--or "dozzing"--works. A blog's readers are unaffected by dozzing. Only the hacker knows when a website has been taken down. To see the evidence that a site has been disabled, one must go into the Apache logs. Ordinary readers just keep using the site as normal. In frustration, Th3 realized that Mildron didn't have access to the MinerBumping logs, and would therefore not be inconvenienced by any downtime MinerBumping might experience. His boasts only resulted in his name being put on the Red Pen list. Th3's sense of reality collapsed. 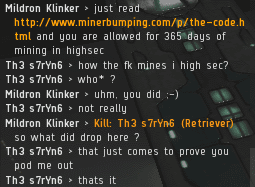 He didn't believe himself to be a highsec miner. He believed himself to be a 2006 character, an elite PvP'er, and a powerful hacker. Yet the rest of the human population, lacking access to Th3's logs, lived in a different reality--one in which Th3 was just another helpless carebear who lost a fail-fit Retriever. In truth, MinerBumping can't be taken down by a dozzer or a bulldozer or whatever the rebels come up with next. It is supported by three Gibson supercomputers. Even if a rebel managed to hack one of the Gibsons, the motors on the other two would begin whirring and instantly pipe the extra traffic into their own databanks. All of this guarantees that the reader enjoys an optimal MinerBumping experience. And the New Order continues its triumphant march through cyberspace. Maybe if Th3 s7rYn6 had substituted even more letters in his name with numerals he might have raised his hacker credentials to a level where he realized he didn't know what he was talking about. I am Th3 s7rYn6! As nobody can see, I have already taken down your Apache server. . . . . logs. This vile act on my part of course can not be seen by visitors to the site and causes no interruption in service but is nonetheless a nefarious act for which I am proud of. Now comply with my demands for 300 billion isk (or a one year mining permit) or I will be forced to taunt you a 2nd time! He couldn't hack together a decent retriever fit. How does he expect to hack the Invincible Website? Would anyone be interested in a shareholder vote where we place a permanent informal bounty on The String? Perhaps 15 mil for every barge, 45 mil for every Exhumer killed? We cannot tolerate the threats of terrorists, no matter how silly their names may be. I hope he wasn't petitioned. He clearly needs the attention of men with soothing voices and white coats. A rabbit's in the system! Its easy to bring ANY webside down! You dont need to be hacker, you dont need to know IT knowledge. Do you know what "Denial of service" attack is? Some years ago ddos successfully stoped Americab Express and E-Bay webside. So be carefully whom you shot, or simply minerbumping.com would not stop but the access to the webside for everyone wouldnt be possible. yes we know what a DoS attack is. So does Google, who hosts the blog, so it's got that going for it. Neither ganker nor carebear dont know what ddos is. It is still a big Problem, if done right, not even the big are safe, atm blizzard has been attacked several times. So please,not every ganker is an idiot nor is every miner/carebear an idiot. Why give your dollars to 'russian hackers'? I did a quick google of the top hacking countries/individuals. Of the top 10 countries involved in hacking, China and the US come first and second, respectively. Russia is 4th. Of the top 25 hackers caught worldwide, only one is Russian. US hackers make up the vast majority of the rest, with one or two Antipodeans, a Canadian and a Scot, among others. I don't cite this as gospel, of course; depends on who's doing the reporting. Neither am I attempting to slander the US (or China, for that matter). But you should beware of making unsupported claims in the presence of an Organisation made up of intelligent and rational members who can spot bigotry and ignorance from a considerable distance. "Of the top 25 hackers caught worldwide, only one is Russian." Oh he probably did DoS it, very easy to do with backtrack / kali linux. The thing is, everyone his side of his router ie his LAN wouldn't be able to access minerbumping.com. So for him it did work, he denied himself access to minerbumping.com by overwhelming his own router with pings. This happens all the time with so called l33t hackers. Good thing we are not on his LAN! "Good thing we are not on his LAN!" Truer words have never been spoken on this blog except by James himself. Yeah, not to mention everybody who has backtrack/kali automatically thinks they are a "L337 HAX0r" because they believe the OS will magically give you the knowledge to perform pentesting and network analysis without any training at all. I know my way around a computer/network and I still have to do a fresh install on Kali from time to time because I fuxored something up so bad that I hear the "He's dead Jim" in my head. I'd say Th3 s7rYn6 trolled Jimbo rather nicely tbh. Th3 s7rYn6 is that you? I doubt any one could make up the reactions of the care bears and their immense propensity for childish attitudes. If you have any doubts, please feel free to make a character following the box cutter hero method and you'll find out just how out of touch some players in the great Eve Sandbox really are. That tingly feeling that you mentioned? It's cancer. This has been a message from your friendly space doctor. Minerbumping.com: Laugh your way to rock hard abs! Download LOIC and deploy. Cackle maniacally as you DOS yourself. And have your computer introduced into its very own botnet to call home! Enjoy the pedophilia, drug sales, and other nasty illegal activity people are going to use your new zombied computer for under your name and your connection! 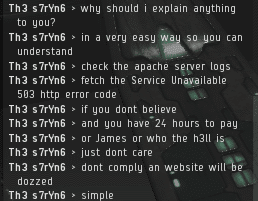 BTW this dude is claiming to be someone in nullsec and allies with you guys. Th3 s7rYn6 breached both the ToS and EULA. I hope this player was petitioned. I'm sure he was, and I am sure nothing will be done about it, seems to be the ongoing pattern I have seen when it comes to raging carebears and CCP. However an example should be made. Terroristic threats are threats all the same, regardless if they are undo-able and coming from a script-kiddie wannabe. Send the police to the little fuckers door, terminate the internet connection of the parents, and fine him till his college fund is in the negative. +1 win for the quality of eves player-base and +1 for the tech community for not having to deal with him, and may the lesson echo across the internet to any other fail script kiddie with an infected packet flooder and crashed router! Yeah.. it's one thing to get pissed and use vulgar language in local chat. I could see CCP being lenient on that one, but it's another thing to rage and threaten people for days about committing IRL crime/s against them. CCP seems to have some double standards when it comes to petitions. They seem to let death threats fly around with impunity, but then turn around and drop the hammer when someone calls somebody, and I quote, "a buttbutt". My sides are in orbit! I get it, being a little buttmad about the situation of losing a poorly fit Retriever only to then receive a suggestion to buy a permit by the pilot who liberated you of said Retriever.. not 100% mind you, but I have lost a ship or two in very dumb ways so I can understand having some type of emotional reaction, but this guy, actually threatening to hit minerbumping.com with a distributed denial-of-service attack because of a game. I mean, if he did pull it off, how many laws would he have broken on the Federal, International level? My guess is that he seems willing to do about a 3-5 year sentence in a minimal security prison for a fail fit Retriever!